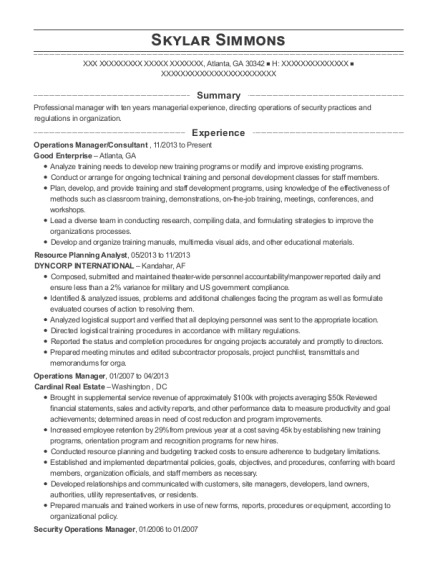 Accomplished and energetic Supply Chain Professional with a solid history of achievement in Production Planning. Motivated leader with strong organizational and prioritization abilities. Areas of expertise include Demand Planning, ERP Implementation and Production Management. Currently training in JD Edwards for ERP implementations. Ultimate goal is to review forms and reports and confer with management and users about format, distribution, and purpose, and to identify problems and improvements. Plan and develop master production schedule allowing sufficient lead time to fulfill customer requirements. Coordinate inbound raw materials as needed to meet production demand. Host weekly meetings to discuss capacity and areas to increase volume. Meet with commercial team and offer suggestions for customer reformulation improvements. Provide trading team guidance for upcoming for tropical oil needs. Manage finished inventory and proactively address shortage concerns. Schedule downtime as needed to complete preventative maintenance on production equipment. Host daily meetings with production supervisors to review production schedule. Direct involvement with transportation to ensure truck/rail movements are planned with sufficient time to meet required delivery dates. Expedite schedule changes as necessary to satisfy customer needs. Participate in facility safety inspections and address opportunities for improvement. Oversee staff which provides analytical and Product Development support to customers, Research and Development Managers and other functions within Cargill. Communicate with Technical Service Managers and the sales team to establish expectations, upcoming projects, and other assignments. Exceed customer expectations by clearly communicating priorities, providing status updates, and advising any scheduling conflicts. Schedule, coordinate, prioritize, track and follow-up on all related support activities requested by DSO Technical Service Managers and the sales team. This includes, but is not limited to, sample requests, fry laboratory, analytical laboratory and pilot plant processing activities. Arrange transportation (international and domestic) for product development shipments. Implemented and oversee departments preventative maintenance, HACCP plan, and master sanitation schedule. Effective management of departmental budget. Maintain positive relationships with vendors to ensure lowest cost and best value of service. Host daily meetings and assign expected deliverables. Publish a daily report to the Technical Service and Product Development Managers providing analytical data for completed projects and capturing current and upcoming project status. Provide focus areas, development plans, and performance reviews for each direct report. Implemented policies and description summaries to ensure the highest level of safety is provided. Blended and further processed Product Development samples and shipped for customer evaluation. Completed analytical Titrations (Free Fatty Acid and Peroxide Value). Completed SOP's (standard operating procedures) for processing equipment. Implemented a new shipping schedule resulting in an annual cost savings of $20K. Monitored shipping cost and provided a monthly saving report. Assigned each department a production schedule and reviewed progress. Adjusted production schedule as needed to satisfy customer needs. Hosted team meetings to provide coaching opportunities. Conducted performance reviews for each direct report. Assisted with FIFO (first in, first out) implementation. Assisted with WCS (warehouse control systems) implementation. Completed equipment maintenance as needed. Process Operator Jan 1999－Jan 2002 Cargill, Inc － Charlotte, NC Effectively operated vegetable oil processes including: Crude unloading, Bleaching, Hydrogenation, Deodorization, Finished oil Packing and Loading. 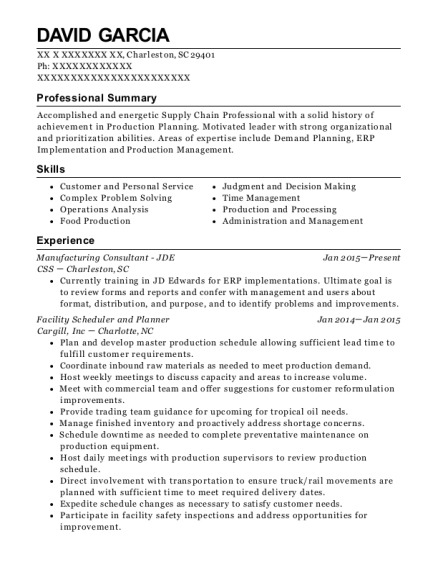 This is a resume for a Manufacturing Consultant JDE in Charleston, South Carolina with experience working for such companies as CSS and Cargill. 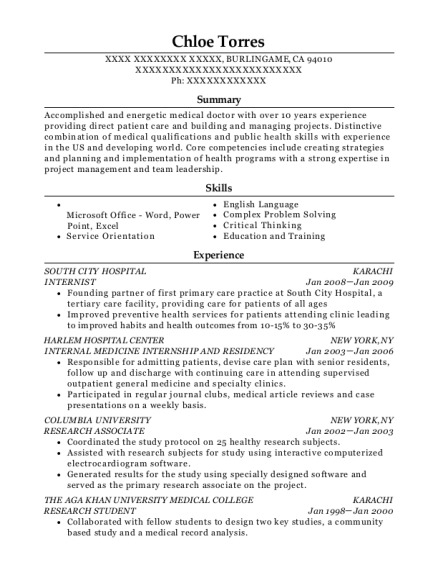 The grade for this resume is 0 and is one of hundreds of Manufacturing Consultant JDE resumes available on our site for free. 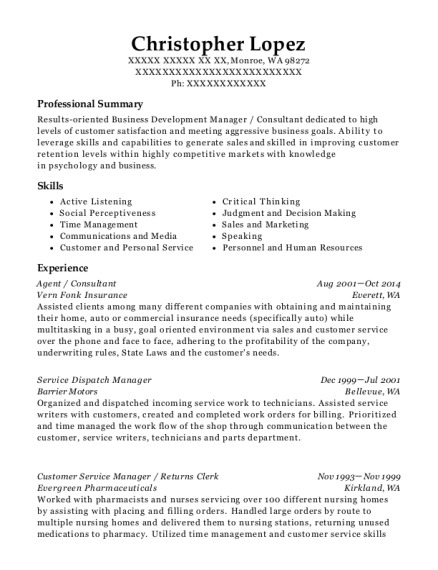 Use these resumes as templates to get help creating the best Manufacturing Consultant JDE resume.